Disposable latex gloves fit like a second skin and are suitable for all levels of incontinence treatment. Powdered and non-powdered available in S, M, L and XL. Disposable latex gloves are premium grade medical gloves that fit like a second skin. They have superior dexterity and comfort, to take care of any mess that may be created by urinal or faecal incontinence. The gloves have a high level of sensitivity when compared to other gloves and can be worn for an extended amount of time. The gloves will contain latex, so if you or the person you are treating suffers from an allergy to latex then a latex free glove would be a better option. We have a vast range of latex-free gloves available. 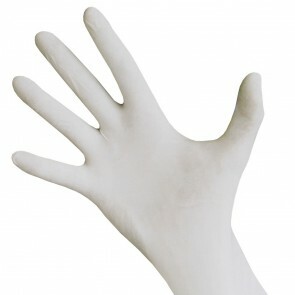 We stock both powdered and powder-free latex gloves. Powdered gloves help with taking them on and off. Powder-free will not leave a residue on your hands or the area that you are treating. The gloves are non-sterile. If you require sterile gloves, then we have other types of sterile gloves available. Available in sizes; small, medium, large and extra-large.